Batesville was first settled in the 1860s with the namesake Bates family arriving around 1869 and starting the Bates Ranch. The Leona River was dammed in 1876, to irrigate crops. The 500 irrigated acres were then sold off in small plots to farmers. After irrigation the community assumed the name of Bate's Ditch and when Zavalla County was formed in 1884, the town took the more dignified name of Batesville. The county built its first courthouse in Batesville in 1884, using mud from the Leona River to make bricks. A post office was granted the same year. The town had a respectable population of 500 by the early 1890s. In 1927 Crystal City took over as Zavala county seat, although Batesville's economy stayed strong. The population in the early 30s was down to 200 with only four businesses. Prosperity came after WWII when increased irrigation was installed and the town was electrified. The population remained at 200 in 1947 but the droughts of the early and mid 1950s took its toll and the irrigation system was neglected, resulting in the company losing its charter. The 1963 population was estimated at 250 but fell to less than 200 by the 1970s where it remained through the 1980s, increasing slowly to the current (2007) population of 1,298. Zavala County was created in 1858 from Maverick and Uvalde counties. Named for Lorenzo de Zavala, a veteran of the Battle of San Jacinto, the county was not organized for judicial purposes until 1884. In that year citizens elected county officials and selected Batesville as the county seat. 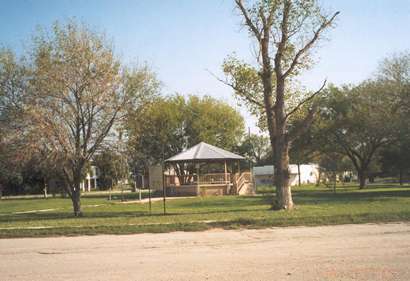 Batesville originally was known as the Bates Ditch community or Bates City. Elijah A. and Ellen J. Bates are credited with its founding. They came to the area in the late 1860s and became a prominent ranching family. Bates, who is credited with the first irrigation project in the area, began selling two-acre plots of the irrigated farmland, and a settlement grew up near his home. 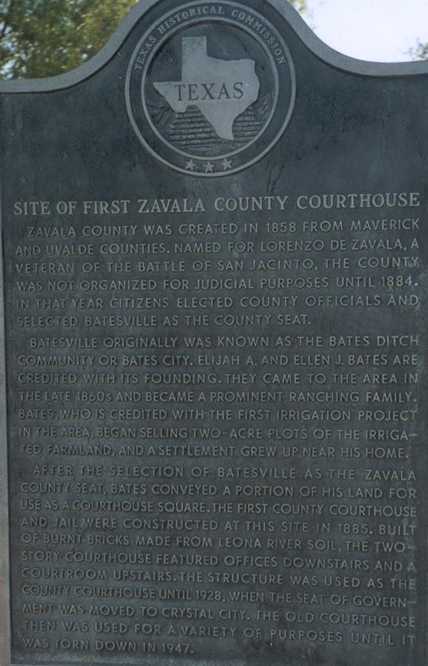 After the selection of Batesville as the Zavala County Seat, Bates conveyed a portion of his land for use as a courthouse square. The first county courthouse and jail were constructed at this site in 1885. Built of burnt bricks made from Leona River soil, the two story courthouse featured offices downstairs and a courtroom upstairs. The structure was used as the county courthouse until 1928, when the seat of government was moved to Crystal City. 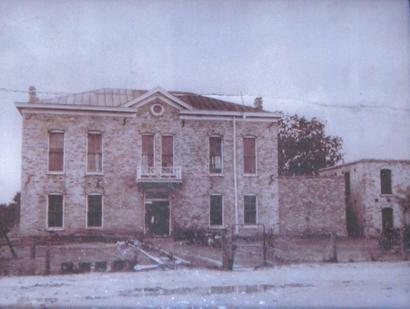 The old courthouse then was used for a variety of purposes until it was torn down in 1947.